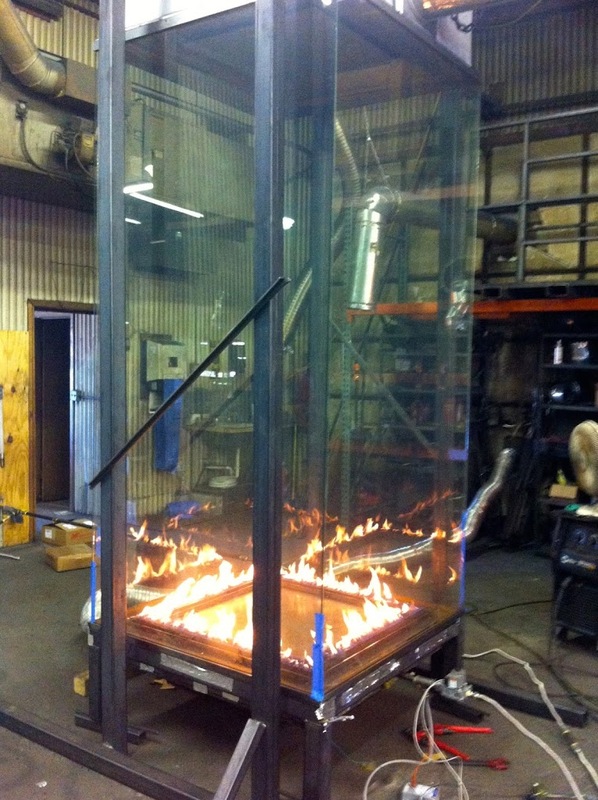 We recently finished building and testing a very tall 11′ high, glass on glass fireplace. The viewing area is 8 feet high and 4 feet wide equally 128 sq. ft. of total viewing are. The fireplace is designed with a base to be installed on the floor and a hood to be installed within the ceiling. With a total system height of 11 feet, the all-glass surround still gives the fireplace a very elegant look. The tube steel shown in the photos is only being used to support the hood during testing in our facility. When installed, the hood will be secured inside the ceiling and only a 3″ steel reveal is view able at the ceiling. Because the hood is secured within the framing above, there is no need for any structural supports between the base and hood, maintaining the clean, unobstructed view. If you have any questions or would like to learn more about our gas fireplaces, please give us a call or click the link below and fill out a short form.